Softail Medusa Header. : Big power boost, aprox 15 more HP using our AMS & high flow intake. tuned chambered muffler that has a real deep tone, Fits 07 thru 2017 Softail models. Click the Harley Davidson button to check out all of our Harley exhaust including the 2018 Softails. Our Stubby Chief War-Header is available for the 2014 up Indian Chief Classic, Vintage & Dark Horse. Very deep loud tone with lots of power! Available in Chrome or Black, Black looks great on the Dark Horse. Our Scout & Octane Mayhem are now Available, Please see our Indian & Victory page for more info. We have our new 2015 Indian Scout, Slip-ons are ready (please see our facebook page for videos) Ripper's, Zoomies and stepped headers are in the works! These will add a big performance boost & style to the new Scout! Honda Fury Ripper's are now available, please see our metric page for more info. We now have S.O.B. 's for the Victory High Ball, Vegas 8 ball, Boardwalk, Kingpin. the Judge & the new 2015 Gunner! Check out our Victory page for more info. Finish options include all Black Ceramic, Black ceramic pipes and chrome Shields (Shown), also Silver ceramic pipes with black heatshields. Our New War-Header can be seen and Heard on you tube. "Honda Fury Mayhem" 2010 Honda Fury Mayhem System. Comes in all chrome, all black ceramic, black ceramic with chrome heat shields or upgrade to designer heat shields. We also have the AMS available for the Honda Fury. Purchase both the pipes and the AMS and get the package deal discount for retail customers only of $120.00 off the total purchase price. "HD Dyna Track Tuned Header" 99-05 Dyna Track Tuned Header: Our Track Tuned Header has great looks to go along with the power increase of 16 hp and nearly 20 ft lbs of torque over stock. We offer several options including finish and tuned inserts. Give your Dyna the edge in POWER with our Track Tuned Header. "MEDUSA HEADER" Hacker Custom Exhaust introduces our newest high performance header, the "MEDUSA". This header fits HD Softails 8+ thru 08 and Indian 99 and up. Very agressive styling to match the performance and sound. Comes with finish options and choice of tuned inserts. "VICTORY TRUE DUALS" True Duals for the 06/07 Victory Kingpin & Vegas models, UPDATE 08/15s. The Tru-Duels are avaiable in Chrome or Black ceramic finishes, with your choice of Tuned inserts, including the quiet option. The 08 up Victory Tru-Duels have the 02 ports installed. For more info go to our Victory page..
"DYNA WARHEADER" Our newest addition for the Harley Davidson Dyna Glide. 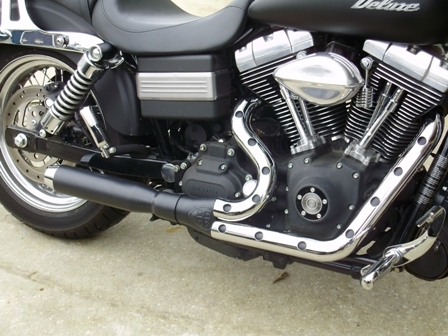 The War-header has three length options, 9" muffler (shown) 12" muffler and 16" muffler. Also choice of finishes. 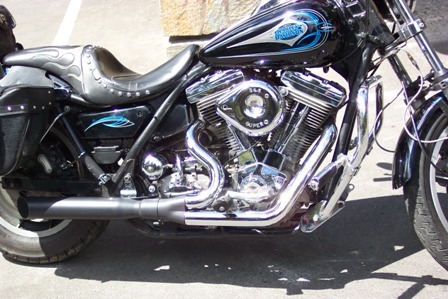 Go to the Harley Davidson section tab for more information on this exhaust system. The Dyna Track-tuned header is also available, without the holes in the heatshields and comes with a Slash-cut muffler. NEW "MAYHEM" Hacker Custom Exhaust introduces our new "Mayhem" for HD Softails. 86 up. 02 sensor ports are installed for 07 up models. Great price, Great performance increase & Great looks!. NEW "BAGGER MAYHEM" "Mayhem" Brand spankin new item for your Harley Bagger. Will fit 99 thru 2011. It's in production now. Check out the prototype picture. NEW "WARHEADER" Hacker Custom Exhaust now has our "WarHeader" for Indian Spirits, Chiefs 99-2011, Scouts, BMC Choppers, Harley Davidson Softails and Dynas. The War-Header is designed for superior looks and high horsepower applications. More mid-range and top end power than Thunderheader with a deeper toned bark. 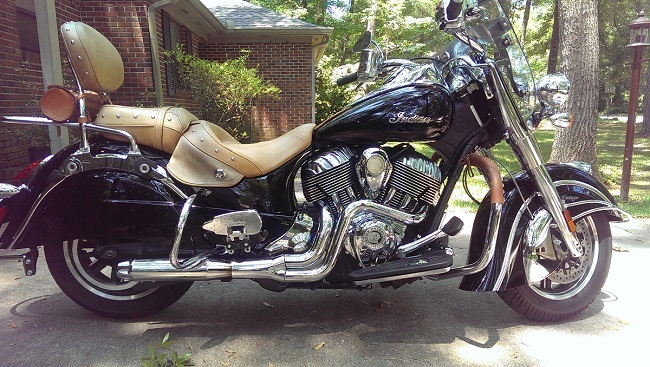 Picture shown is chrome warheader with 12 inch muffler can on 2001 Indian Spirit. Length options on muffler can are 9 inch, 12 inch and 16 inch. NEW! Hacker Custom Exhaust introduces it's FXR Track Tuned Header System for 1986 thru 94. These have been in high demand. Outperforms Thunderheader. Our Warheader version is also available. 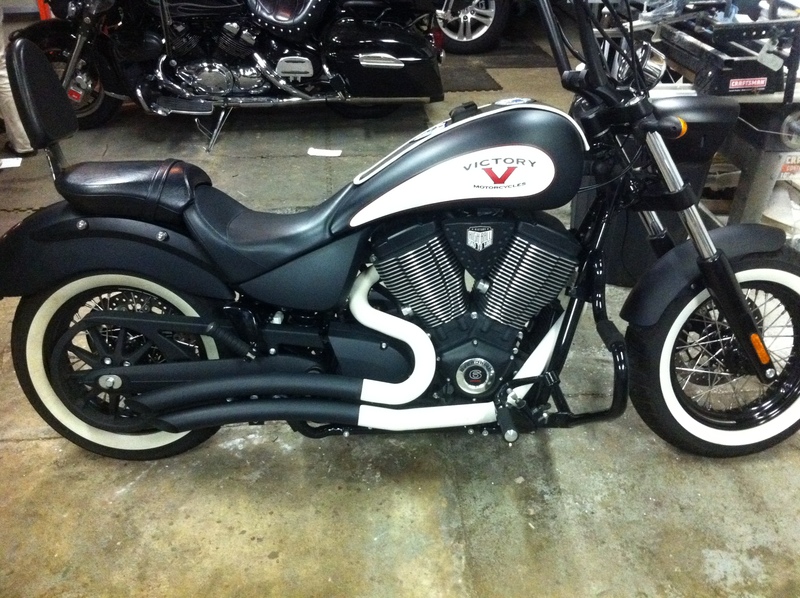 Hacker Custom Exhaust has a great Dealer & Distributor program. Email customerservice@hackercustomexhaust.com for the dealer app. Please supply web address and company email address. Hacker Custom Exhaust now has High Performance stepped Tru-Duel exhaust system available. Our Tru-Duels will fit the Cross Roads, Cross Country & Hard Ball. These provide a huge power increase with a nice sounding tone. The pipes are stepped from 1.750 out of the heads then step up to 1.875 pipes, the mufflers have big 2.250 dia Tuned cores and the pipes come with 2.250 dia Designer heat shields. Options will be all chrome, all black or Black pipes with chrome Designer heatshields, of course we will be offering these in our quiet version for those who ride is noise sensitive areas. 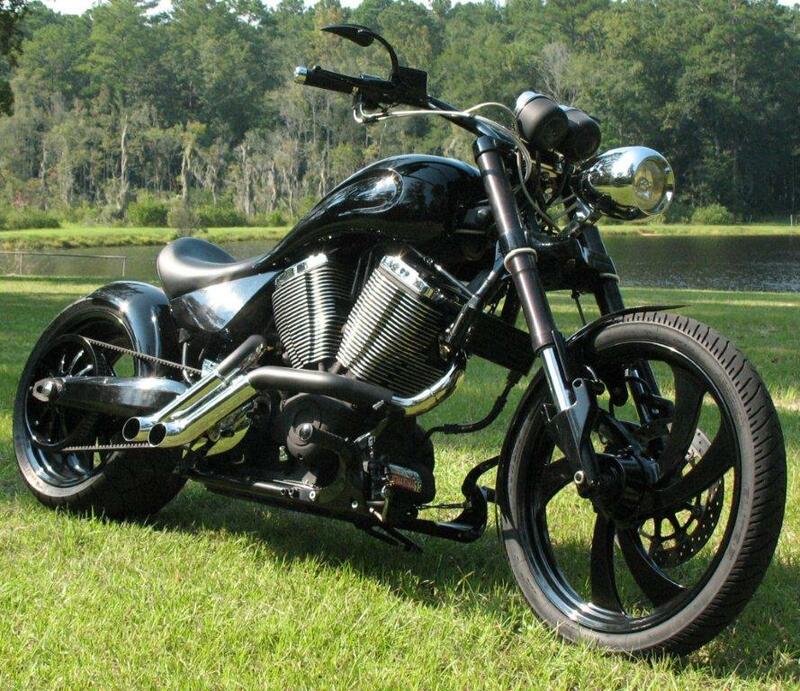 Check out our "VICTORY' page to see how good these look on the Victory Bagger's! ZOOMIE QUIET OPTION New quiet option is now available for the Zoomie exhaust. Available for the 06 thru 2015 models. Just select this option on the ordering page. This will take the decible levels down to about 96-98 dbs. This is a very popular exhaust, so if you want it loud, you got it. If you want it toned down, you got that too. ON LINE WEBSITE ORDERING MADE EASY. It's easy to order through our website even if you have options in mind. Just choose the basic finish, hit the recalculate button on the order form and the drop down menu will let you choose additional items such as AMS or whatever options are listed for that exhaust. Just wait a couple of seconds after hitting recalculate then pick the items that you want. Click the recalculate button each time you add an option. If you have any doubts, there is a comment section on the bottom of the order form which will let you clarify your order. "NEW AMS(EFI)2018" WE have the AMS modules available for all of our exhaust systems. EFI Modules for HD Softail,Dyna Glide, Baggers and Indian Chiefs are here and ready to go. Our AMS is Plug & play, no splicing, adds the fuel needed to run with our High performance exhaust! "Victory High Ball & Judge" YES YES YES, Hacker Custom Exhaust now has 5 exhausts that are perfect for the new High Ball, Judge & the Boardwalk. Our Jokers, Zoomies, Rippers, Lake pipes and SOB's look great on these new bikes plus add a huge power increase! We are offering these in all black ceramic,and options of all chrome, black pipes with chrome heat shields and black pipes with white ceramic heat shields. Our AMS (EFI) has been upgraded to include the new High Ball, Judge & Boardwalk. Designer Heat Shields We have new designer heat shields for the Victory. These are a upgrade option for just $20.00. You can see pics on the Victory page or the Suzuki page. These are a great option when ordering new pipes or you can order separately from our tips and options page. We have also added a new tip style. New Style Header Hacker Custom Exhaust will have a new high performance Nostalgic Header for the 2002-2004 Indian Chiefs and the 09 and 2010 Chiefs with the 02 ports. Picture is coming soon. 2009/2010 Indian Chiefs Hacker Custom Exhaust Tru-Duels for the 2002 thru 2010 Indian Chiefs. These will come with heatshields, Whaletail tips and a choice of tuned cores including the quiet option. The 2009 and 2010 models will have the 02 port installed. Finish options will be Black Ceramic or Chrome. Need or Want our product? If you can't get it from your local dealer, order it direct from our website. We just might be able to get it for you a bit quicker. "AMS" Hacker Custom Exhaust announces the great success with this product for the Victorys's, so now we have developed our AMS for nearly all Harley-Davidson's and the Metric Cruisers. Our AMS has proven to work great with stock bikes and in high performance applications. NOW AVAILABLE!!! Anger Management (EFI) - A self contained, user friendly way of Fuel management for H-D, Victory, and Metric cruisers. NEW! Hacker Custom Exhaust and Power Products can custom build almost any pipe you can imagine. We have now expanded our services to include fabrication, welding and complete from ground up custom builds. Custom Pipes are built in-house.